This is part two of a five-part series. For part one, click here. Hello, class. 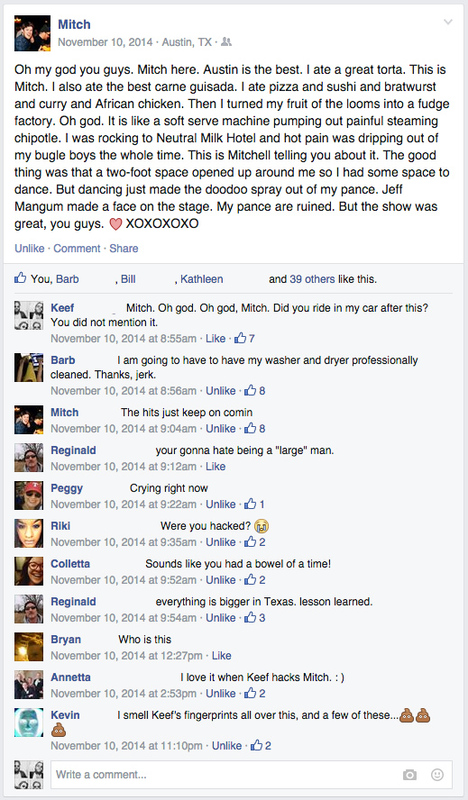 Welcome to Mitching 102: Advanced Mitching. In this class, we'll build on yesterday's lessons, providing some new twists and turns. NB: For some reason, his phone autocorrected "Mitchell" to "MITCHELL." I thought it was funny, so I left it like that. Some eagle-eyed students may have noticed a theme beginning to present itself during yesterday's lesson, and now I would like to bring that additional step to the forefront. Immediately after posting as your opponent, "like" and leave a comment on the post itself. I prefer to leave a comment expressing disgust and dismay, both at the act of soiling oneself and at the "choice" to describe the act in detail in a public forum. This serves three purposes: One, as a sort of "tag" to claim credit for your work. If your comment falls within a minute or two of the post itself, it acts as a blame-taker, alerting future comment viewers that you have performed this devilish stunt; Two, it adds a level of humor, as you can ramp up the chuckles by compounding the situation; and Three, it propagates the post. Any additional "likes" and comments push the post up in Facebook's algorithm, ensuring that your masterpiece will be seen by more people. 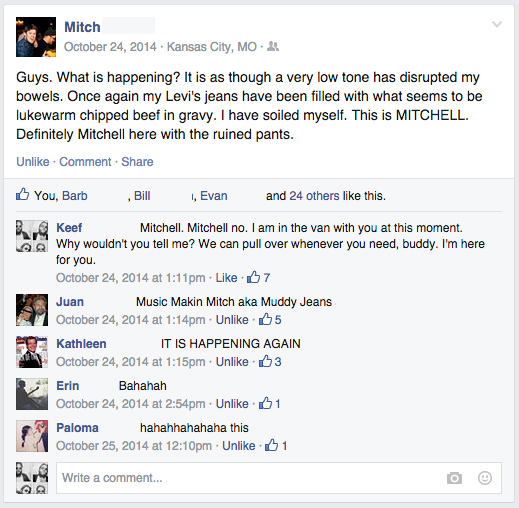 At the end of 2014, Mitch came down to Texas and we all attended Fun Fun Fun Fest. It was a fantastic time. As he was packing up to go, and loading stuff out to the car, I offered to create a driving playlist on his Spotify. I did so, and the playlist is awesome, because I am awesome and Mitch is awesome and the taste that we share is awesome. A true masterwork, if I do say so myself. This brings Mitching 102 to a close. Join us tomorrow for MITCHING 103: SUPER ADVANCED MITCHING. UH OH! I MADE AN ACCIDENT! Keef here. One minute I was sitting in thoughtful reflection and the next IT. FELT. LIKE. SOMETHING. WAS. ALIVE. INSIDE. ME. WELCOME TO BROWN TOWN! I am pouring buckets of chili cheese out the ample legs of my Manpris like so much Ebola. I'M SWIMMING IN IT! IT'S FILLED UP MY SHOES AND SOAKED MY SOCKS! FOR THE LOVE OF GOD, MONTRESOR! FOR THE LOVE OF GOD! THE HORROR! THE HORROR! This is totally Keef, by the way. Totally KEEF! Luckily, I wasn't logged into Facebook. Preserved by my paranoia once again! That said, note Bill's skill in crafting this fine Mitch. I do occasionally wear Manpris, providing realism to the scenario; there are repeated declarations of identity ("Keef here;" "This is totally Keef, by the way;" "Totally KEEF!"). Plus, it's pretty goddamn funny.